Monitors Windows text and event logs on servers throughout your network, offering prompt notification of key events so you can take suitable and timely action. Consolidates, archives, converts and exports the log information to meet your compliance needs. - Oversee any log on your network (Microsoft Windows security and other event logs plus any text log, including Unix). - Select from real-time or planned monitoring on a per-log basis. - Combined event log data. - Very configurable real-time filters, alerts and actions. 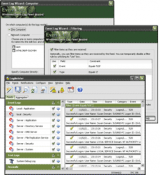 - Malleable archiving, reporting and data export options. - Choice of Microsoft-approved event gathering technologies. - Agentless solution with endless scalability. - Very competitive pricing model. Monitor any type of log on your computer. Monitor the logs from other machines. The program's numerous settings can intimidate inexperienced users. LogMeister has been tested by Download82.com team against viruses, spyware, adware, trojan, backdoors and was found to be 100% clean. Our editors will recheck this software periodically to assure that it remains clean.